We love a good slice of cake and we adore seeing pictures of all the gorgeous cakes and cupcakes that couples go for on their big day. And what you put on top of your cake is what interest us most. Don't get us wrong - we adore the minimalist approach of leaving the top of your cake bare, but there's something about crowning your cake; about topping it off that just elevates it to being that much more special! Clockwise from left: We adore this look for a rustic wedding. What could be simpler than thin branches forming the support for a mini-bunting delight? Use "Just Hitched" as shown in the picture above, or the couple's names. This is a great and easy DIY if you're prepared to go that route. It doesn't get much cuter than a penguin in a top hat! This cake topper is different, quirky and so very cute! We'd put a little flower or a veil over the little girl penguin to complete the look. These wooden cake toppers are unique and simple. The best part? They'll make great ornaments to your home as a reminder of your special day! This fondant bow is classic, refined and oh-so-beautiful. We adore the addition of macaroons to this delight of a cake. 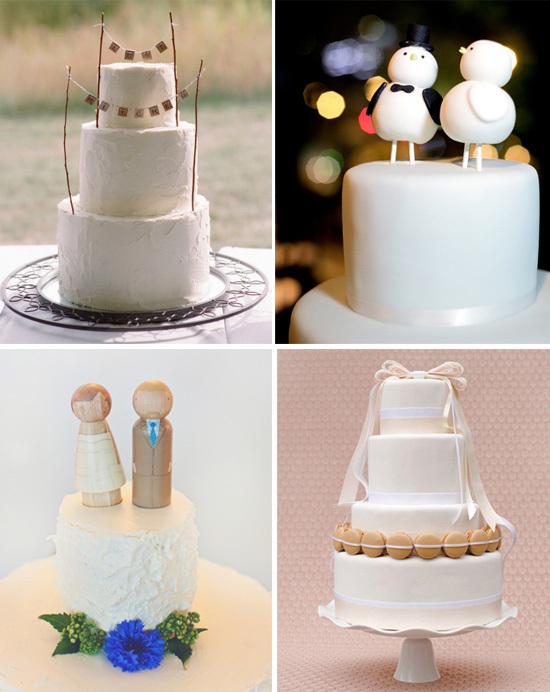 Bannered cake toppers are so on trend now - we love the quirky appeal they add to your cake. And you don't have to do something run-of-the-mill either. The three examples above are each unique interpretations of this trend. We especially love the chalkboard topper - how beautiful. Along with banners, pom poms are a wedding trend here to stay. We're used to see them hanging from trees in a ceremony space or adorning a reception ceiling. We love them as cake toppers because they're simple and boldly effective. We think these would be great on a birthday cake too! We simply can't fault the above two cake toppers. They're both so different from each other, and yet equally appealing and striking. The elegant, flowing flowers and the engraved silver hearts are both great ideas - which is your favourite? Picture credits in the above paragraphs.